Bharati Sethi’s lifelong dream had always been to attain her PhD, and in 2014 she made it a reality when she graduated from Laurier’s Faculty of Social Work with a focus in Community, Planning, Policy and Organization. Sethi’s story is one of dedication and inspiration. She came to Canada from Mumbai as an immigrant at the age of 19, with a passion for social work and a desire to bring about social change and social justice. 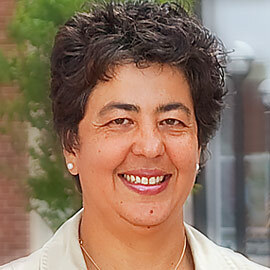 Sethi completed her Bachelor of Arts, her Master of Social Work and ultimately her PhD at Laurier. Her research focused on issues affecting immigrants and refugees in Canada, specifically those who reside in small and mid-sized urban-rural regions in Canada. In addition to her academic research, Sethi has continuously devoted her own time towards developing programs and policies to help immigrants in rural communities who may not have access to support. Her community-based research project, titled “Do you see what I see?” uses photography to explore the experience of women from Korea, Asia, Africa, Japan, the Arab World and Latin America at an employment health association in Brantford. Sethi has received numerous awards recognizing her success and contribution in the field of social work throughout her educational journey. This past year, Sethi was one of 15 recipients of the Newcomer Champion Awards presented to individuals and organizations for their significant contributions to fostering a more welcome society by the Province of Ontario. In 2013, she received the Citizens Award from the Member of Provincial Parliament for Brant in recognition of her research and community work. She was nominated for the Top 25 immigrants to Canada and was honoured as one of Laurier’s 100 Alumni of Achievement in 2012. She is also the recipient of several scholarships, including the Primary Health Care Fellowship and the Vanier Canada Graduate Scholarship (PhD), and she was the first to receive the Inaugural Hilary M. Weston Scholarship (MSW).